Avatar design could be said to be a new literacy. When playing digital games and social networking, kids often select and customize avatars to represent themselves. They offer opportunities to experiment with different identities and take on roles within the specific context of the game or community. They also offer the opportunity to design with different media and think symbolically about how to represent ‘character’. 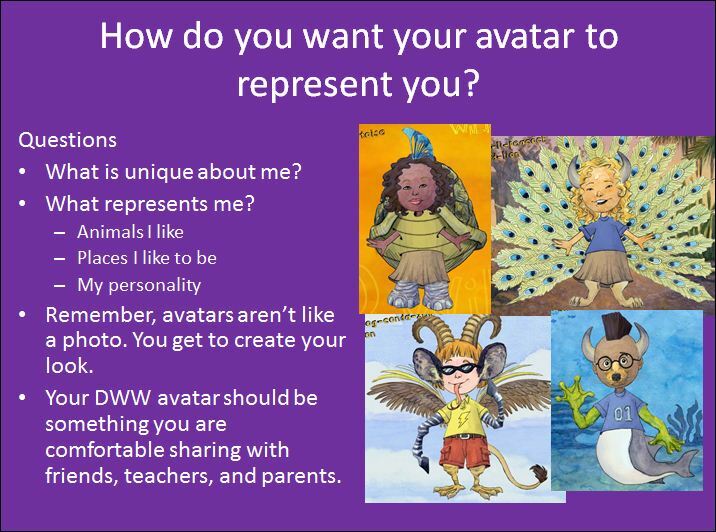 This past summer, I used an avatar design activity to launch a Digital Writers’ Workshop with urban middle school students who were participating in a summer school program. Collaborating with a group of doctoral students (Blaine Smith, Christian Ehret, Summer Wood, Tyler Hollett and Robin Jocius), we used the avatar design activity to help us all get to know one another and to introduce kids to the notion that they are multimodal designers and could communicate with different symbol systems (a key theme of the workshop). Across a series of composing activities, we tried out a scaffolded approach to multimodal composition: Demonstrate, Create, and Share-reflect-respond, or DCSrr for short (Dalton, 2011). Below, I describe this process and share some examples of students’ work, along with their design reflections. 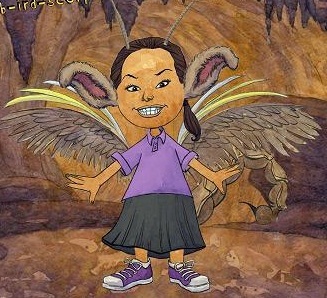 The first challenge was finding an avatar design tool online that was free, appropriate for young adolescents, and which ran on the lab computers without glitches. Blaine and I spent a few hours searching, finding some very cool sites that we had to reject, typically because they required registration with a commercial enterprise (something we wanted to avoid), the images of females were highly sexualized, or there were few multicultural options. 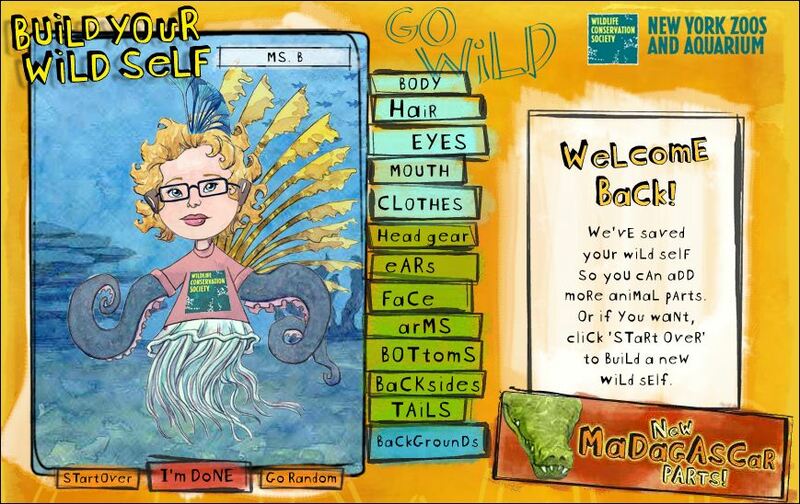 We hit pay dirt when we found the “Build Your Wild Self” website sponsored by the New York Zoos and Aguariam and the Wildlife Conservation Society (http://www.buildyourwildself.com/). 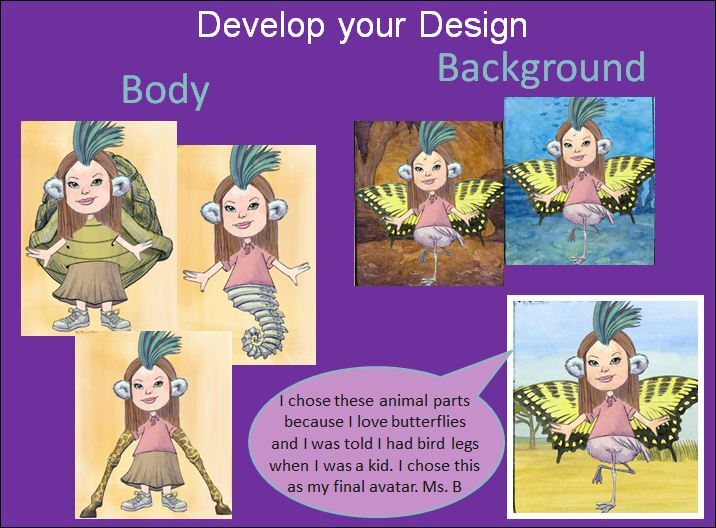 Of course, the first thing I had to do was design my own avatar to explore the tool and think about how kids would use it. Here is the home page, which displays my avatar. Antennas: I picked the antennas because I can search out things and I also need glasses to see. Those are kind of my little glasses. I can do anything I want to do and see stuff and if you mess with me, I’ll stick you. Parting shot: Fun? Yes! Multimodal composition? Yes! 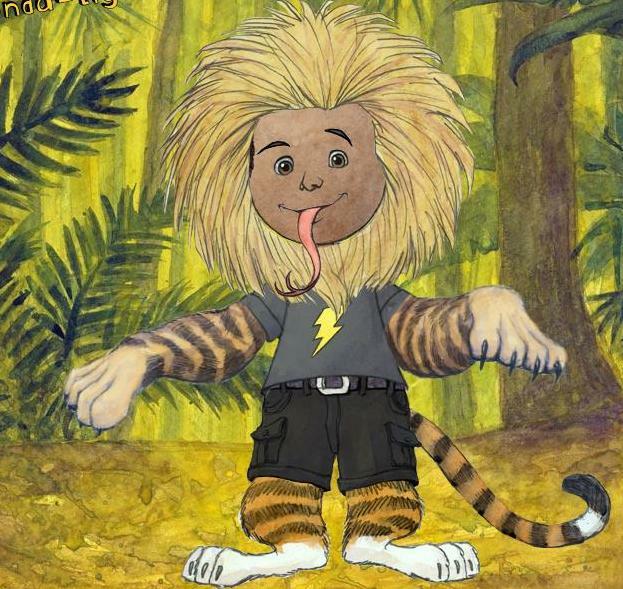 Try designing your own ‘wild self’ and then try it out with your students. I would love to hear how it goes (post a comment, please!). Connecting writing instruction with students’ love of on-line gaming is a very effective way to engage all students, but especially those who don’t see the value of education. I am grateful that someone else took the hours of searching and evaluating to find an appropriate website. That is often daunting and an obstacle to teachers using technology in the classroom.